Very often the Lord’s way is not our way. His perfect path is not the same path we foresaw for ourselves. His way is higher and wiser and better. After Israel’s deliverance from Egypt, the Lord led His people toward the Promised Land. His pillar of cloud led them by day and His pillar of fire led them by night (Exodus 13:21). He was their guide and they made their steps with easy and comfort, because He was with them. But then the Lord lovingly took His children on a detour to both test and teach them. He called them to camp on the beach in front of the Red Sea (Exodus 14:1-2). He ordained their curious campout because He knew that a hardened Pharaoh would see it as an opportunity to pounce on the people once again (Exodus 14:3). God called His people to camp there so that they would be pressed hard by uncertain circumstances. What strange love this is, that God would put His people in a position of danger and distress—on purpose. And as God predicted, Pharaoh rallied his army and pursued Israel as they camped in their most precarious position. 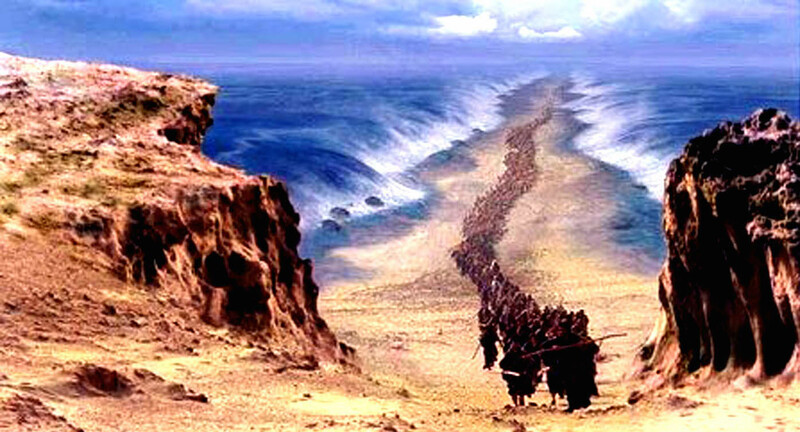 As the chariot wheels bore down upon their resting place, their backs were pressed against the shore of the Red Sea. What would God do? All they could imagine was that God had brought them out of Egypt to die on a barren beach like abandoned children (Exodus 14:10-12). They had no way of escape; but the Lord had a way, He always does. As Pharaoh and his blood-thristy army gained ground on Israel, “Moses said to the people, ‘Fear not, stand firm, and see the salvation of the Lord” (Exodus 14:13). Their campground of certain death was about to be transformed into a stage on which God would display His faithful love. God had a plan to deliver His people. God’s way was the unforeseen way. It was the unimaginable path. They would not, in ten thousand years devised the plan God had known for all eternity. Moses could never have included the shortcut through the sea on the itinerary of the Canaan-bound children of God. God’s way was through the sea. God’s ways are not our ways. His ways are higher than ours. They are wiser than ours. They are better than ours (Isaiah 55:8-9). Remember this child of God, our Father often acts unconventionally. He regularly chooses the unseen path for His people to walk on. He always has a way to save His people, but very often it is through the sea. He will always provide, but it is often from sources they would not have suspected (1 Kings 17-7; Matthew 6:25-34). God is faithful, but He is rarely predictable. God is trustworthy, but He is marvelously creative in the way He cares for us. He seems to delight in bringing us home by the way of the sea so that once we have set our feet on the dry land of our destination we can say nothing except “God did this.” In the end, God ordains His way through the sea that “I will get glory” and so that all “shall know that I am the LORD” (Exodus 14:4). What more clear example of this truth can we have than God’s provision of salvation through Christ. Who could have ever imagined that God would save rebels by becoming like them and dying for them and rising from the dead to provide salvation for them? I am not sure what provision or protection or direction you are seeking from God today, but rest in this truth: God’s way is very often through the sea. He puts His children in precarious positions on purpose. He does not do this to destroy our faith, but to strengthen it. For once He has helped us to step across the threshold of our straining circumstances, we will see that God is the wise and trustworthy Savior of His people. He ordains His way through the sea so that His children can forever look back on their lives and see that time and again His ways are good and His love is faithful. Trust Him today child of God, wait upon His way—even if it is through the sea. This entry was posted in Provision, Uncategorized on April 24, 2015 by garrettk. A great reminder, Garret. I have always loved the phrase that follows, “yet your footprints were unseen.” Even in the deliverance God is not “visible” in the physical sense, but He is there, right there, with His people. Where would we be without those unseen footprints?